A Florida woman recently inherited a family mystery. 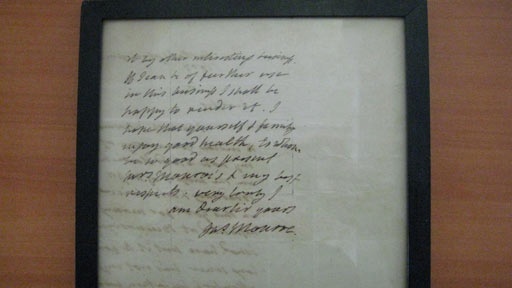 In her late mother's belongings, she stumbled on a framed letter allegedly penned by future President James Monroe in 1807. Our contributor has recognized a family name “Manwaring” scrawled near the date, and believes the letter references a monetary debt the financially unstable U.S. Government owed the Manwaring family. The document leads to a tale of terror on the high seas, when American merchant ships were stalked by Britain, their cargo pillaged and their crews forced into the British Navy to fight against France. Young America was desperate to avoid war, and James Monroe, then Minister to Britain, attempted to mediate with his pen. History Detectives tracks a conflict that nearly bankrupted America. Also with Gwen Wright U.S.S. Thresher Do these documents disclose information about U.S. secret weapons in the Cold War? Also in Season 6 Mankato Spoon What does this delicate silver spoon have to do with the largest mass execution in American history? Related Investigation Revolutionary War Cannon Is this the cannon that ignited the first battle of the Revolutionary War? Also with Gwen Wright WWI Chemical Warfare Map Could this map be an authentic relic from a critical WWI battle?